Dewakan has put Malaysia on the world map with his entry in the Asia’s 50 Best Restaurants 2019 list. With all eyes now on Malaysia and what we have to offer beyond street food, we are expecting local restaurateurs, hoteliers, chefs and food connoisseurs upping their ante with exciting four-hands, kitchen takeovers and other unique dining experiences. Before the Ramadhan season starts and restaurants filling their kitchen counters with a plethora of local delights in time for buka puasa, allow us to tantalise your tastebuds with new menus as well as a little something for Easter that includes a chocolatey afternoon tea and a traditional Italian fare. If you love the sparkly jewels from Tiffany & Co, this is an event you don’t want to miss. The brand has curated a designated corner at The Lounge in Four Seasons where you’ll be given an all-star luxurious experience while enjoying a selection of tea and scrumptious Tiffany-inspired delights. Check out also the tableware that is made specially for this event including the Tiffany cutlery that is only available if you book a table for 8 persons. The much talked-about Grandmother’s Table is a concept by Chef Giuseppe Lioce. He revisits some of his fondest memories in Italy when every Sunday is a visit to his Grandmother’s house for a big Italian feast. Everyone at the table shares the food while reconnecting new and old friends. He is bringing this idea to Nero Nero with classic Italian family cooking comprising five starters, four mains and three desserts. Enjoy the flavours of South Italy (Puglia) on the 7th April and a special Easter rendition on 21st April. Japanese Master Chef Tokukatsu Toh will be in resident at Lai Po Heen from 8 to 14 April 2019 to showcase Cantonese cuisine perfected with Japanese philosophy. Chef Tokukatsu is the third generation in his family of chefs focusing on Chinese cuisine. He brings over two decades of experience, which includes being Chief Chef of Michelin-starred Sense Restaurant at Mandarin Oriental Tokyo. He currently runs his own restaurant, ‘Kiseki Japan’ which is located in Kanagawa prefecture. There are lunch and dinner set menus as well as ala carte dishes served during his takeover. Chef Tokukatsu will present some of his signature creations including Jasmine Tea Smoked Golden Pomfret in Honey Sauce and a Japanese-style Tan Tan Noodles. Chambers Grill at Hilton KL is bringing in the premium Queensland Grass-fed Black Angus beef to the table for the whole month of April. Served in a New York Strip style, the perfectly grilled beef is an indulgent treat for celebrations or a dinner for two. Pair it with a glass of Shiraz 2014 on the side, which is highly recommended by the hotel’s very own sommelier. The most glamorous brunch in town is back this month at Flock. Enjoy a specially-curated menu by Chef Richard Mille and team, highlighting locally sourced ingredients, heirloom vegetables and the freshest catch. Enjoy the Sunday Retox Brunch with creative cocktails and table-to-table performances. There will also be a special Easter Edition on the 21st April 2019 where you stand to win free stays at the W Kuala Lumpur. RM188++ per adult or RM98++ per child with non-alcoholic drinks / RM288++ per adult with cocktails, wines and beers. Kikubari has launched a new Spring menu with Chef Jun Wong using speciality ingredients from Japan flown in twice a week. This tasting menu features her progressive Japanese cooking philosophy which includes dishes like seasonal Japanese fish with warm soramame rice, and duck ham with tea-infused kyuri. The menu, which will only be available in April comes with a special sake pairing featuring some of the finest sakes from Japan. Celebrate timeless family tradition of togetherness at The Astor Room with its signature Easter Sunday Brunch curated by Executive Chef, Pedro Samper. Enjoy live kitchens, a carving station with Roast Beef Sirloin as well as fresh seafood corners featuring Alaskan king crabs, French oysters and more. 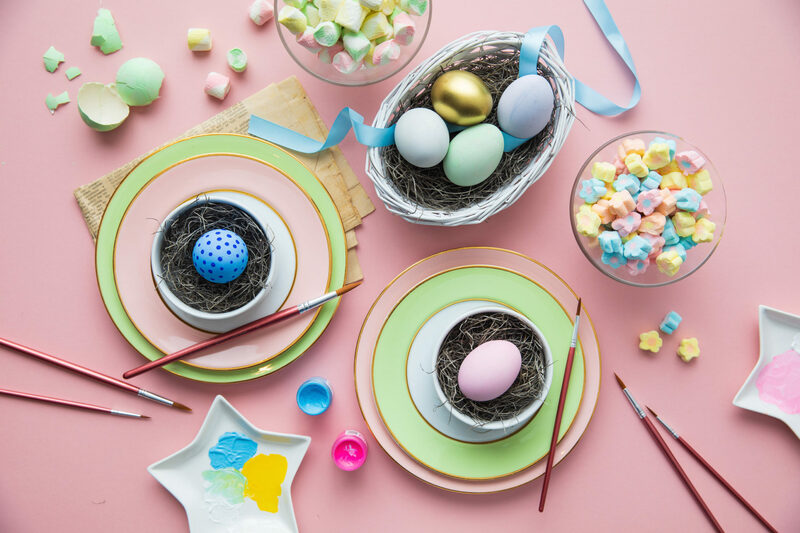 There will also be a series of traditional Easter activities for children including St. Regis KL’s signature egg hunt, and Easter egg painting with Chef de Patisserie Hassan Mohamed. Over at the Drawing Room, there will be a festive touch throughout the week of Easter with an Easter-themed Afternoon Tea. Take home its signature 1kg solid chocolate Botero Horse – moulded like the same horse sculpture by Fernando Botero that sits majestically in the hotel’s lounge – as well as traditional Easter egg chocolates and cookies for gifting. Experience the beautiful marriage of sweet rum and bitter chocolate in the Tipsy Chocolate cocktail concocted by the brains behind W Kuala Lumpur’s Woobar. There will also be a chocolate and rum pairing by local chocolatier, Chocolate Concierge and Diplomatico Rum during this two-hour event. Enjoy some of the best local chocolates and taste how they behave with the flavours of rum. Grand Hyatt KL’s Executive Chef Rolf Knecht has curated a special afternoon tea that highlights chocolate. Enjoy an indulgent cocoa-rich weekend afternoon filled with chocolate savouries like white chocolate baba ghannouj and cocoa espresso Black Angus beef meatballs; guilt-free bites like the sugar-free chocolate mousse and gluten/sugar-free chocolate cakes; as well as dainty sweet treats like burnt Pahang chocolate crème brulee and its signature brownies made using four different types of chocolates from Malaysia, Belgium and Switzerland. Le Meridien KL will be celebrating Easter with a bunch of fun activities for family and friends. Indulge in a brunch spread of local and international delights, filled with live-cooking and colourful dishes prepared a la minute at five open kitchens in the Latest Recipe. Enjoy classic recipes like BBQ Glazed Beef Prime Ribs with Yorkshire Pudding, Roasted Stuff Chicken, Hungarian-style Rustic Roasted Leg of Lamb and Hot Cross Buns.